This is a high value for one author. It means the author participated (we do not distinguish in the order of author names when calculating citations, all authors are equal in this regard) in the authoring of 40 articles of which each has been cited at least 40 times. Think about that for a moment…that's some impact! Still, this value may still be unfair. 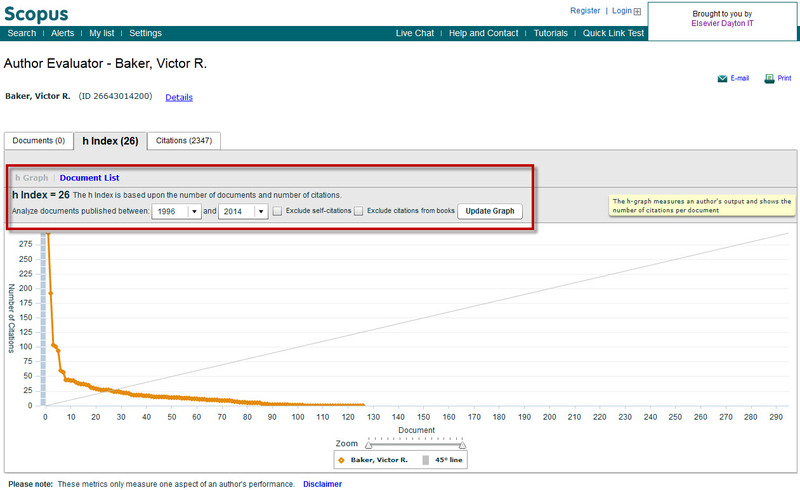 Because for all these articles: AU-ID("Baker, Victor R." 26643014200) AND PUBYEAR BEF 1996 we may be displaying a low citation count that’s too low (though this will be changing, read more on the Scopus Cited References Expansion project). To even things out, we display an h-index value on author profile page that only uses documents published in 1996 or later. And when visiting this page, a user may be shocked to find that the value is only 26.That's a big difference, it must surely be wrong! But it isn't; if you read what the value represents, we state that "The h-index considers Scopus articles published after 1995." and that is not quite the same thing as "not having complete citation information for pre-1996 content". 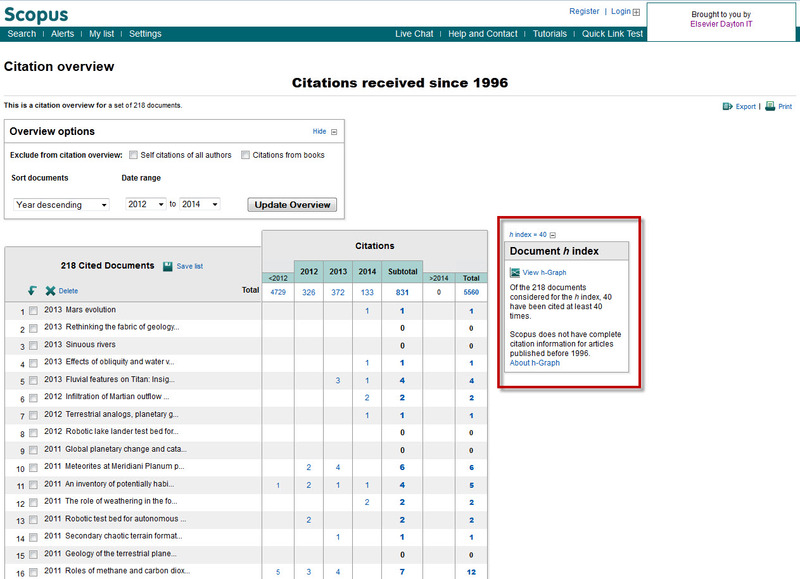 And if you follow the link to Citation Overview, you will see the same 5,120 total citations given to Baker's papers, but the h-index here also says: "The h-index considers Scopus articles published after 1995." But why... which one is now correct? They both are! It really depends on what you want to evaluate. It can be confusing when an author first sees the high and then the low value; and it looks to them like something broke or citations got lost (or we are just being mean). Sometimes we receive feedback that we should simplify things and decide on one method and discard the rest. But it's all a matter of choice. Author pages show the h-index for content published in 1996 or later because we are confident that we can present a comprehensive, fair and relevant overview. At the time Scopus was launched it was shown that most people are actually interested in the research and impact over the last 10 years. Not that the previous stuff doesn't matter, it does, just not as often.